Walt Disney World was built in Florida after the success of Disneyland California. It opened to the public in 1971 and has entertained over 1 billion guests since then! Orlando today is a tourist mecca, all thanks to Disney's vision. 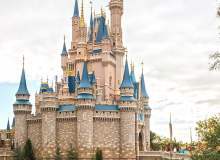 Many people have gone to the Disney World parks and fallen in love with them. These people know all sorts of facts and trivia--or at least, they think they do! But this 15 question quiz will challenge that knowledge. So, how much do you really know about Walt Disney World? Which "mountain" was there on Magic Kingdom's opening day in 1971? Which of these is NOT a country represented in Epcot's World Showcase? What was Disney World's first water park? What was the name of the ride before it became the Gran Fiesta Tour Starring The Three Caballeros? What is your destination on Mission Space? Which of these attractions did NOT exist on Magic Kingdom's opening day in 1971? The iconic Epcot ball is called what? The 3D show "Captain EO", which has been featured in Epcot, stars which pop singer? Which ride has the fastest top speed in Disney World? Which town was built on Disney World land in the 1990s, where you can buy a home? How many Magic Kingdoms could be fit inside Animal Kingdom? None. Magic Kingdom is larger. In which year did Disney MGM Studios become Hollywood Studios? A secret mission game starring which characters can be played in the World Showcase at Epcot? Which of these attractions first debuted at the 1964-65 World's Fair? Which attraction closed permanently in 1994? How well do you know Disneyland, CA? by Crocodiles Rule!